In 1941 as the world plunged into second world war(WWII), school teachers Pete Dalrymple and Ruth Griffith were married in Mt. Gilead Ohio. In hardly any time at all, they were separated by Pete’s U.S. Army service in Europe. The couple exchanged letters almost daily throughout Pete’s deployment. While Ruth’s letters are lost, we have Pete’s letters and Ruth’s columns that she wrote as editor of the Morrow County Sentinel. Tam Dalrymple’s presentation will include readings juxtaposing her father’s letters with her mother’s newspaper articles. Woven into the talk, Tam will touch on the resources used in compiling the book. George Needham, Director of the Delaware County District Library, will introduce the speaker and presentation. Tam Dalrymple recently retired from over 40 years of librarianship, having worked in reference services at the Columbus Metropolitan Library, The Ohio State University and OCLC in Dublin, Ohio. 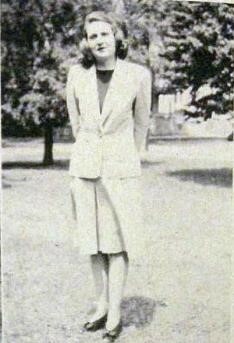 In 2016 she did research for and completed a hand bound book, Letters to the Editor, which juxtaposes a selection of her father’s WWII letters from Europe with her mother’s articles in The Morrow County Sentinel, which she edited throughout the war. 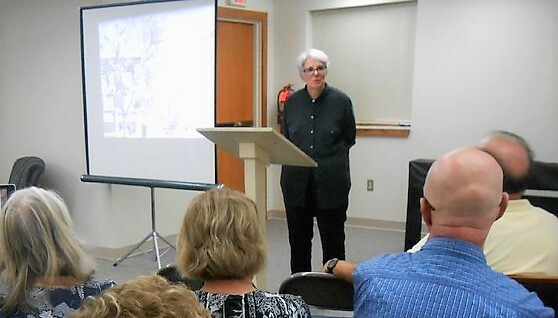 She has given a similar presentation at the Mount Gilead Public Library, and the hand bound version of the book was displayed at the McConnell Arts Center in Worthington in an exhibition last year. The book will also be available for viewing after the program. This program is open to the public. No ticket or reservation required. An opportunity for Donations will provided. This illuminating presentation, attended by over 40 participants, revealed two aspects of this couple’s life, one personal, and the other being a portrayal of war. The main thrust was Pete’s love letters to his wife Ruth, proving the old adage that “absence makes the heart grow fonder”, especially since they didn’t see each other in over three years. Despite the distance and time apart, their love never waned. Perhaps the most significant letter we saw was dated June 6, 1944 when the D-Day Invasion took place, in which Pete frankly stated, “I wish I could be there with them, as strange as that might sound”. In retrospect, it made me wonder how he felt about those men who were storming the Omaha and other beaches, many giving their “last full measure of devotion”, while he was safe back in England. Although Pete was never in combat, he saw the horrifying results. On a lighter note, after France was liberated, he was able to visit Paris, where he bought multiple bottles of perfume, and told his wife which ones are for her (not knowing if she’d like them) and what she should give as gifts and to whom. Upon returning to civilian life, Pete enjoyed a new career working for the County government. You can read more about the Letters to the Editor book in Joe Blundo’s Columbus Dispatch commentary: World War II years revealed in writings of Mount Gilead couple.